After the Galaxy Note 10.1 was announced, our good friends at Samsung let us know that it would be "coming months". Looks like the wait was far shorter as, once again, our friends at Samsung have let us know that the Galaxy Note 10.1 is now available to Canadians. As a reminder of the specs the Note 10.1 features a 10.1 inch 1280x800 display, 1.4GHz Quad-Core Exynos processor, 2GB of RAM, 5MP rear facing camera, 1.9MP front facing camera and of course S Pen. Check out the press release after the break. We will try to have a review for you guys as soon as possible. 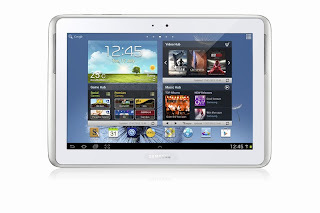 MISSISSAUGA, ON, September 21, 2012 – Samsung Canada, today announced that the highly anticipated GALAXY Note 10.1 is now available in the Canadian marketplace. The device is available for purchase at authorized retail partners across Canada. The GALAXY Note 10.1 extends the GALAXY Note category, building on the success of last year’s worldwide hit smartphone – and delivering the functionality and precision of a pen and paper by combining the S Pen with a 10.1-inch large display. Featuring an advanced S Pen with 1,024 levels of sensitivity, GALAXY Note 10.1 is designed for natural and intuitive content creation. With GALAXY Note 10.1’s Multiscreen feature, users can effortlessly utilize two different applications side-by-side simultaneously for true and easy multitasking. Users can view Web pages or videos, or launch other applications while writing or sketching ideas with the S Pen on the other half of the screen – no need to toggle back and forth between apps. The Galaxy Note 10.1 features applications to meet the increasing needs of a growing mobile workforce, from interfacing with customers to creative sharing. Featured applications include: S Note, Internet Browser, Video Player, Email, Gallery and Polaris Office. The S Note application is a unique tool that gives users the ability to combine notes and sketches with other digital content in ready-to-use templates. Shape Match converts hand-drawn shapes such a square and lines into clean and perfect versions – perfect for creating charts and formula Match can actually solve formulas hand-written with the S Pen. The S Pen is embedded directly into a slot in the device and when removed, activates a taskbar with quick access to optimized S Pen apps such as S Note, Adobe® Photoshop® Touch and Polaris Office Alternatively, users can easily set their preferred application to be launched instantly. S Note is also integrated with knowledge search engines so that users can search for content, obtain information, and easily drag and drop content onto S Notes without having to switch between screens. Adobe® Photoshop® Touch, is preloaded on the GALAXY Note 10.1 and is optimized for S Pen, enabling users to control brush size and opacity by just adjusting the pressure of the pen on the screen. Users can also use popular Photoshop features such as layers, selection tools, adjustments, and filters to create mind-blowing images, or use the high quality GALAXY Note 10.1 camera to fill an area on a layer with the unique camera fill feature. With Photoshop Touch, it’s also a snap to add or remove people or objects from a photo, or blend two photos together. Photoshop Touch is integrated with Adobe Creative Cloud providing users free access to powerful file syncing and sharing features and 2GB of storage space. Files can be synched to the Creative Cloud and opened in Photoshop on the desktop or laptop for further refinement. Samsung Smart Remote, powered by Peel, utilizes the built-in IR emitter in the GALAXY Note 10.1 to transform the device into a sophisticated universal remote control that can control an entire home entertainment system and even recommend programs. Finally, Polaris Office lets provides robust word processing, spreadsheet and presentation capabilities, while S Pen support makes it a snap to mark up and annotate documents. GALAXY Note 10.1 will be available for $499 MSRP at major Canadian retail partners beginning September 21st, 2012. For additional information, please visit www.samsung.com. * *See www.dropbox.com/help/338 for terms and conditions of Dropbox offer. Samsung Electronics Canada delivers unrivalled consumer experiences. Samsung enables Canadians to pursue their passions by offering a broad range of award-winning digital consumer electronics, IT, telecommunications and home appliance products. The Canadian arm upholds Samsung's global mission to provide consumers with innovative digital convergence products that possess exceptional technology, quality, features, performance and value. As a result of its commitment to innovation and unique design, Samsung has become one of the most decorated brands in the electronics industry. The company was ranked #17 in BusinessWeek/Interbrand "100 Best Global Brands" and was named as one of Fast Company's "50 Most Innovative Companies of 2011."